I had a couple of Hush Puppies but won't have those again. The soles break too easily after a year or so. I have a pair of Julius Marlow which are pretty comfortable, plus a pair of Bostonian (US brand), which are the lightest I've ever seen. For other occasions I have a couple of pairs of Timberland shoes. Those tend to last long as well. Julius Marlows died too early on me so I won't go back to them. 2) They have lasted really well, since I glued leather inserts inside around the back of the heel. Every single time I get any new shoe of any brand they wear out there, and some Addos and some leather offcut strips from trademe cut to size/shape have done wonders. 3) Price, they're comparatively cheap. The problem I've found with all formal shoes, including pricier ones I used to buy, is that crack along the tops and/or the sole due to being constanly bent while driving (mostly the clutch foot since it get more use during suburb / city driving). I could do what many women do and have a second pair of shoes just for driving, but I can't be bothered having to keep changing them. I've tried buying cheap, eg warehouse or number 1 shoes and they didn't last and weren't very good. Sometimes getting quality is worth it. Good to see others have the same opinion that JM shoes are comfy but wear fast. The problem I have with cheap shoes is they smell "cheap" and it never really goes away. While I agree with the sentiment, I find that the expensive shoes I've bought in the past don't last anywhere near as long as I hope. For example I often also buy the warehouse cheapies and find they last around 3-6 months of fairly hard use (I tend to walk quite a lot and am not a small man :) ) - At $15-30 a pair this doesn't work out too badly. But if I spend $200+ on a pair of good shoes I would sort of expect them to last at least a couple of years, hopefully longer when comparing them to the warehouse ones - but I haven't found this to be the case with the last couple of pairs I've bought. Maybe I've been buying the wrong brands though - I'll definitely have to give Ecco a try at some point, this isn't the first time I've come across the recommendation. And yeah, this is comfort and style to consider as well as price. I have Hush Puppies, and whilst very comfy, the soles do break. My current ones are Colorado's, which have been briliiant. a coupld of years of everyday wear, and no holes/breaks (yet). They do look a little tatty (light tan colour) but I like them. I bought them in Australia 3 years ago, can't find them again. Will have to try the Ecco. I can't afford $280 for NZ bought ones though, so will have to take a punt on the sizing (my Colorados have the 3 size numbers in them). Edit, should have said, I have tried Warehouse/No1 shoes, and they either never have anything my size that looks any good (I am a NZ 12.5/13), or they are so uncomfortable, or they fall apart within a couple of months (I am admittedly very hard on my shoes). Allen Edmonds Park Avenue. A little expensive but they're great shoes. I went through a couple of pairs of Hush Puppy shoes - They used to be Made in Australia and were great - really comfortable to walk distances in. The soles did tend to wear a little quicker than I would have liked though. Then I bought a pair which looked the same model etc - but the leather was hard and not so comfortable - turned out they started making them in Fiji - maybe used different leather. Next time I looked in a shoe shop the same model was made in china - they didnt look as well made as the original Aussie ones. I have tried some cheap No1 shoes work shoes - ok for the money I suppose - but you couldnt walk too far in them. Really need that combination of sport shoe interior with the polystyrene insert/supports and soft leather combined with a good durable non-slip sole and smart business like uppers. Fortunately I can get away with wearing sport shoes to work these days so not so much of an issue anymore. $200 for a pair of shoes - only for the well-heeled I'd say! Oliver steel capped work boots for me, being out in the field and on building sites means they are a requirement, they also have anti static soles which comes in handy when dealing with static sensitive equipment. 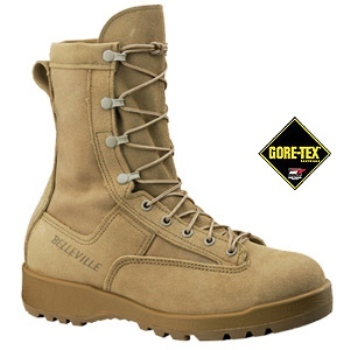 I wear a pair of Bates Gore Tex Military Combat Boots to work. They have the US Marines insignia on the side. Comfortable to wear and do just as good a job inside on the carpet of a customer's house as they do walking through ankle high mud and water at an airsoft game. I got these brand new landed for $160.00. I've had them for about 4 or 5 years. It might seem a little over-kill...But you never know where that ankle high puddle is on a wet day on Queen Street. bazzer: The problem I have with cheap shoes is they smell "cheap" and it never really goes away. Yeah don't know what it is, cheap glue but the cheap shoes always smell worse. If I'm in my caravan at home I don't bother with shoes, the Kapiti Coast is warm enough. If I go out then I have a pair of blue suede Adidas Samba's and a pair of blue suede Adidas Gazelle's. If I'm going to be on my feet for any extended period of time then it's my Asic's DS Trainer 17's. All bought from prodirect in the UK, all for less than half what they sell for over here, but that's for another thread. A point I forgot to mention was the idea shoes should last x number of years, but that's rubbish, especially if you're talking about sports/running shoes. They last a distance not a time. If you have good shoes and you walk/run any sort of distance you cant expect them to last. A podiatrist once said to me if you can press the sole of your running shoes and two creases in the side overlap, then it's time for new shoes. I've worn Ecco's for a few years now and would be on my 4th pair. Owning and using two pairs at a time will help them last a lot longer than buying one pair at a time... of course, at $250-$300 per pair, it's an expensive exercise. However, as we all only get one pair of feet in our lives, it does pay to look after them. Keep them clean and shiny and you'll love Ecco's - give them a go.